When Torrance Hart decided to separate from the US Air Force, she started seriously thinking about what business she could start. 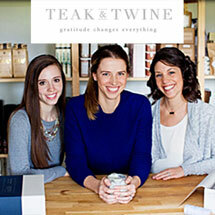 She worked with an existing business, then bought out the owner in Teak & Twine. Interestingly, she says she didn’t find that owning her own business is as different from being in the military as one might think. Both involve being extremely organized, disciplined and self- motivated. So in a lot of ways, it has been a natural transition for her. The VBOC has worked with Torrance since she attended the TAP Boots to Business workshop at Hurlburt AFB. VBOC has assisted her with advice on investors as well as providing industry-related contacts.